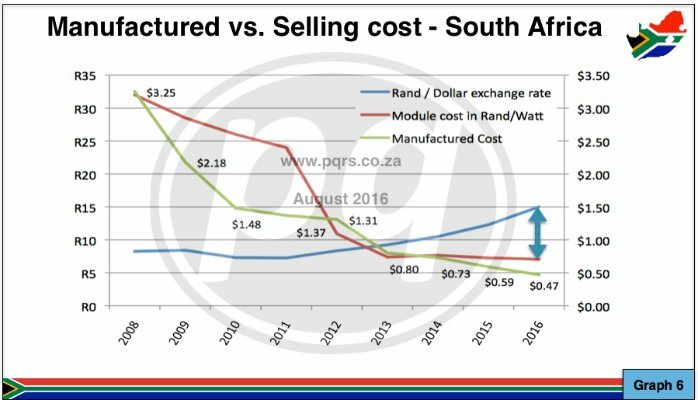 Graph 6 displays the cost variation between the manufactured cost of PV modules, the local selling price and the rand dollar exchange. The graph is intended to display the difference in manufactured and selling price of modules for the local market. The only way in which this can be done comparatively is through the context of the R/$ exchange rate at the time of sale. The value chain in SA usually allows for a manufacturer, importer or distributor and then the re-seller who eventually makes the product available to the end user. Costs reflected in the graph may vary slightly from market conditions depending on the perspective taken against the value chain and type of supplier. Module costs reflected in graph 6 would represent wholesale prices. The Blue arrow in Graph 6 could be indicative of the aggressive market strategies implemented by crystalline module manufacturers to gain market share in SA. Even though the Rand has weakened against the Dollar the trend in the selling price for modules has dropped. This may have been due to large volumes of stock being imported at a lower price or different methods imposed by module manufacturers in order to keep stock prices low. From 2008 to 2012 the difference in the manufactured and selling price of modules was primarily driven by a small number of players in the market who determined the selling rate for modules locally on the back of a weak demand. At the time module sales and solar installations were done at a premium as it was perceived to be a specialist product & service. As a matter of interest Picture 1 below shows a screenshot from a South African supplier’s website who were advertising installation services to potential buyers. This picture reflects the cost of solar installations during 2008 and indicates a price/tariff of R80/watt installed. The yellow text oval in the middle of the ad was included by us to provide some context. Today the same system can be installed for R18-R20/watt. Republished with permission from www.pqrs.co.za.